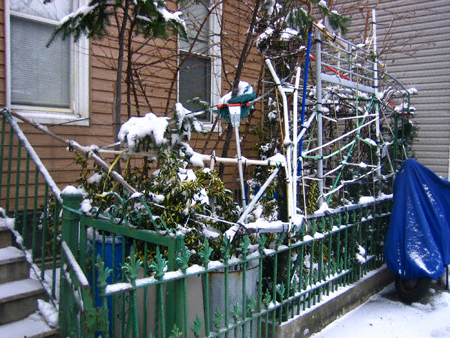 Greenpoint Photos Du Jour: WHAT IS THIS? Okay. This conglomeration of stuff (from Guernsey Street) is nothing new. It has been around as long as I can remember (eight years). 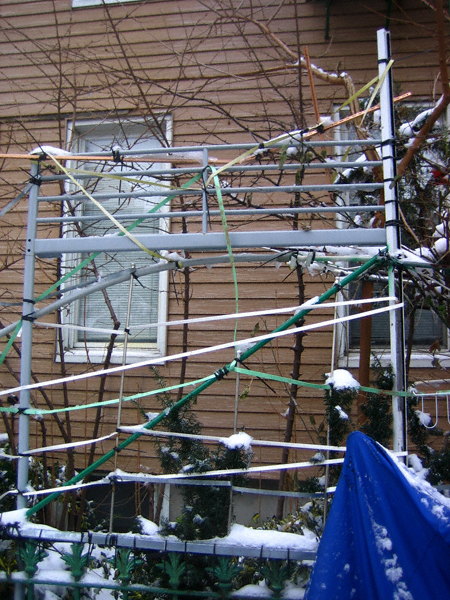 Initially I thought it was a trellis for roses. In the absence of such greenery, however, I am beginning to have my doubts. Whatever it is it has gotten larger over the years. Much larger. I would also be remiss if I didn’t point out that (as a sculptor) I find the assortment of media pressed into service to create this structure diabolically resourceful. Among the items I can clearly identify as components are part(s) of a bunk bed, an ironing board, a shoe rack, several mops, a baker’s rack, a chandelier and a couple of curtain rods. But back to the purpose of this post: what is this? Anyone out there know the scoop? If so, please share. 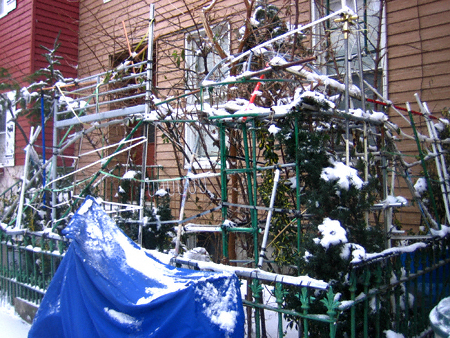 3 Comments on Greenpoint Photos Du Jour: WHAT IS THIS? They are for his grapevines. The back got so out of control he has migrated to his front gate. I smell a vineyard in the making! Maybe this is an equivalent of an electric fence? Is there electric current?